You’ve noticed that more hair is falling out lately. You see it in the sink, the shower, on your brush or comb. You can see your scalp through your hair. You’re wondering if you’re going to go bald. Don’t let this worry keep you up at night. Get the answers you need. Go see a hair specialist as soon as possible. Your regular doctor may not have specific training in treating hair loss, although they could test your overall health to find out why your hair is thinning. Instead, look for a trichologist, a hair restoration surgeon, or a dermatologist who specializes in hair loss disorders. If you live in or near a city, chances are you’re not too far from a hair loss expert. Trichologists study diseases and disorders of the hair and scalp. They can tell you if your hair is falling out because of your diet and stress, or if something else is causing it. Male pattern baldness, or androgenic alopecia, is one of the main causes of hair loss in men. Women can also have androgenic alopecia, although it’s less common. In both cases, look at other family members to see if they had hair loss like yours. The hormonal changes of pregnancy and menopause can also cause hair loss. Some medications, some illnesses, and even too much Vitamin A in your diet can make your hair thin and fall out. 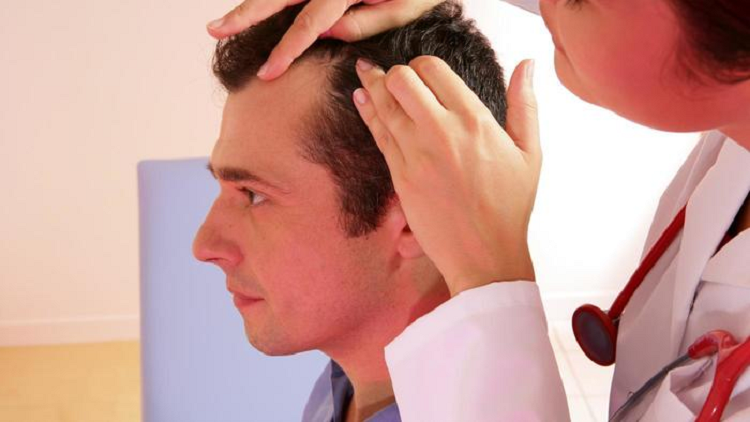 A trichologist or dermatologist may order a blood test and a scalp biopsy to investigate what is causing the problem. Once they have determined the cause, they can give you advice on treating, and possibly reversing, your condition. They might recommend supplements to take, a serum for your scalp, or special shampoos or creams. We’ve been discussing the possible causes behind hair loss, and what a specialist might do to help you grow more hair. If you have prior experience with dermatologists and medical specialists, you know that these treatments could be expensive. Most of the time they won’t be covered by insurance. But you may be able to make your hair loss treatments more affordable. First, shop around for the right doctor and learn about the typical rates for office visits. Read reviews carefully and talk to friends who have experience in this matter. Don’t settle for second-best in this stage. You need the best information you can get about your hair loss so you can save money treating it later. Once you know what steps to take to preserve the hair you have and restore the hair you lost, you can shop for less expensive treatments. Use the power of the Internet to find discounts on medications like Rogaine, supplements like Saw Palmetto, vitamin serums for your scalp, and hair growth shampoos. Again, check reviews and purchase items from reliable sellers. As an example, here are three shampoos that are top sellers on a well-known site. You can usually buy them cheaper online than you can in a store. You may also get free shipping. PURA D’OR puts the power of Argan oil in this shampoo. Argan oil helps your body produce keratin to protect and strengthen your hair. It stimulates blood circulation and moisturizes your scalp. Plus, its formula blocks the production of DHT. DHT is a derivative of the hormone testosterone. It attacks hair follicles and makes your hair grow thinner and fall out. The PURA D’OR shampoo keeps DHT from killing your hair. It’s safe to use on any hair type, and it doesn’t have sulfates or parabens. PURA D’OR recommends at least three months of daily use to see the best results. Apply it in the shower and let it sit for a couple of minutes before you rinse it. Art Naturals designed their shampoo with Argan oil and other natural ingredients to speed up hair growth and make it look fuller and thicker. It also helps keep your scalp healthy. It has aloe vera, rosemary, thyme, burdock root, and white willow bark. White willow bark and aloe fight inflammation while rosemary increases blood flow. It’s a powerful formula, but it’s gentle enough to be used every day on any kind of hair. You drink it, but did you know that putting caffeine on your skin can help your hair follicles stay active and healthy for longer? The Ultrax Labs Hair Surge Shampoo contains caffeine to keep your hair wide awake and kicking. It also has a 0.2% solution of Ketoconazole and Saw Palmetto, both of which block the follicle-killing hormone DHT. The Ultrax Labs shampoo can help fight dandruff, too. Massage it into your scalp and leave it on your hair from 2 to 5 minutes before rinsing for best results. The manufacturer also recommends using it at least 5 times per week. These days, the information you need is only a few clicks away. Take a look at this page that reviews hair growth products that actually work. Once you have a diagnosis from the hair loss specialist, you can search for the products you need to treat it. You may need to spend some time learning about them and reading reviews, but the effort is worth it. You’ll get a sense of what will work best for you, what it will cost, and where the best places are to get help at affordable prices. But what if there isn’t a hair loss doctor near me? You may live in an area that doesn’t have a hair loss specialist nearby. That may be frustrating for you since an in-person consultation is essential for the correct diagnosis. In the meantime, you have options. Visit your regular doctor to tell them what you’re experiencing. They can look at your medical history and order tests to narrow down the cause of your hair loss. They could also prescribe you treatments like Propecia or Rogaine, suggest other treatments, or send you to a specialist. In the meantime, take a close look to see if you can change anything in your life that can help your hair recover. Some people find that simply sleeping more, eating better, and reducing their stress helps their hair grow back. Use a brush or comb that doesn’t pull out your hair. Sleep on a silk pillowcase that won’t put strain on your hair. Avoid hats for a while. Invest in a hair growth shampoo and conditioner. Get a head massage, too. Try these simple changes to see if they work for you. They promote hair growth and reduce hair loss naturally, and they don’t cost a lot of money. You may not need that hair loss doctor after all.